The Procurex reverse auction software platform is a cloud-based solution developed by our purchasing and procurement professionals over the past 15 years. 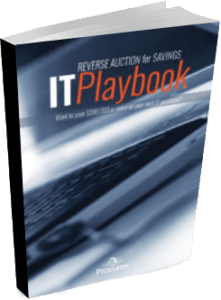 We’ve taken the complex variables and permutations of a reverse auction process and codified them into an intuitive and easy-to-use solution that’s also extremely powerful. Today we are proud to provide what is one of the most advanced and feature-rich tools in the reverse auction industry. The highly flexible solution gives our customers a wide variety of options to fulfill their particular requirements. At the same time, it follows established procurement best practices. The Procurex platform is a central portal where both buyers and sellers can securely access their summary dashboards, individual auction events and flexible reporting tools. Our platform provides both summary reports and detailed reports with bidding data, along with a full audit trail of date and time stamps for all activities. With Procurex, users can compare the opening and closing bids for each vendor in an auction to see highest openings, lowest closings, greatest price swings and more. Need a supplier that isn’t already in the database? No problem! This simple process is initiated by either the buyer, who can register the supplier for the event, or the supplier, who can accept an invitation to sign up. There are never any fees to register on the Procurex site. Simple supplier registration combined with an interface that makes it easy for suppliers to monitor auctions and update their bids means more transparency and liquidity in the entire process. Vendors can see multiple bid events and, for more complex RFPs, multiple line item bids. When compared with traditional paper-based bids, reverse auctions provide suppliers with the ability to compete directly on price rather than submitting one price and hoping to win. But the key is that it must be a fair competition. Procurex works with our buy-side clients to emphasize and ensure that ONLY pre-qualified suppliers are invited to reverse auctions. Once the auction has started, suppliers don’t see the names of the other participating vendors, but they can see how they stack up against the competition and can adjust their bids accordingly. The Procurex platform provides context-sensitive online help for both buyers and sellers to make the solution easy to use, reduce errors and increase use. This step-by-step “green/red” check system provides an easy-to-follow process for buyers to set up and run RFQ/auction events. Buyers can choose from a wide range of auction parameters such as sealed quotes (lock box) and flex lot bidding. Lead/Not Lead, Rank Order, Automatic Extensions, Final Blind Bids, Flex Lot Bidding and a myriad of other reverse auction features allow you to customize each event to the needs of the specific purchase. All along the way, Procurex brings expertise to every auction to ensure buyers get the best possible results. To ensure information integrity, the solution lets users import information from contract writing systems and export final event data via XML data exchange. Philosophies vary regarding who should pay for reverse auction services. Some buying organizations prefer to incur the service fees or subscription themselves. Others view it as a cost of doing business for the participating vendors and require vendors to pick up the fees. Procurex supports either approach with great flexibility. Our platform is fully integrated with the federal government supplier database, providing access to more than 800,000 vetted federal government suppliers. Procurex also can customize engagement to manage suppliers along specific supplier categories. As a SAAS solution, the Procurex platform does not require any software or hardware support from your IT department. A simple internet connection is all that is required to access your auctions. All auctions come with the security and flexibility needed for every specific situation. Procurex employs the latest in server security and hardened encryption to ensure that sensitive data is protected and secure. That includes encrypted login and password protection for secure data management. We're ready to start today with an Opportunity Assessment. We’ll help you find your best bet for savings.